"She is tolerable; but not handsome enough to tempt me." SYNOPSIS: A wealthy and single young man from London, Charles Bingley, has just moved into the Netherfield estate. At a ball he gives for his neighbors, Mrs. Bennet is overjoyed to see that Bingley is attracted to her eldest daughter, Jane. But her second daughter, the witty and independent Elizabeth, is slighted by Bingley's even wealthier friend, the proud and aristocratic Darcy. The spirited courtship between Darcy and Elizabeth — who at first cannot abide one another — is the main story of the opera. They not only misjudge each other, but are both victims of their own pride and prejudices. Only after much sparring and indignant misunderstandings do they come to recognize their own faults and true feelings, and can forgive themselves and each other. “. . . full of strong and distinctive characters, it has an appealing and emotion-laden plot that’s enhanced by underlining it with music; it’s full of dance and spectacle. This is the very stuff of opera. [Mechem’s] libretto is ingeniously written, often using Austen’s own words and filling in gaps intelligently. [His] music is not only attractive, it’s busy and evocative. Vocal lines often reveal character, as with Mrs. Bennet erupting in peals of ornamental notes at words she wishes to emphasize. The orchestra . . . is an active participant in the plot. Dances at house balls enliven Act I, catching up the vocal lines into [their] lively rhythms. . . . Both composition and performance were a real treat. “ . . . does justice to Austen’s classic. The orchestration [is] most exciting, boldly accentuating the drama evolving in Act Two. The score here is sparked by Darcy’s solo aria, a duettino of Darcy and Elizabeth, and Elizabeth’s expansive soliloquy. There’s a poignant duet of clarinet with cello; and, at the other extreme, a true operatic finale complete with festive music and chorus bringing down the curtain. . . . Could anyone serve as a greater inspiration than Mechem for creativity . . . ? 3 Scene 2: A private assembly at the Bennets’ house. Elizabeth finally accepts Darcy’s invitation to dance a stately sarabande with him. 4 Act II Sc. 1: Darcy proposes to Elizabeth and is rejected. 5 Elizabeth has read Darcy’s letter with anger, but now realizes that what he wrote has the ring of truth. This is her principal aria in the opera. It is the most beloved novel in the English language; it has strong and varied characters, humor, opportunities for dancing, for ensembles and scenic beauty, and above all, it is built around one of the most fascinating love stories of all time. These are the hallmarks of opera. While films have the technique to open up action in ways the stage cannot, opera can more powerfully convey the passions and nuances of human emotions. The language of love is music. 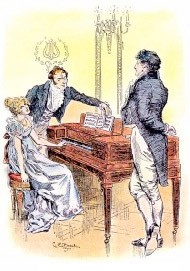 Another reason 20th-century composers ignored Pride and Prejudice probably had to do with musical style. Austen’s novels are so rooted in their time and place, it is hard to imagine them being sung to atonal or dissonant tonal music. I did not consider this a problem, as I have always tried to respect not only the words themselves but the style in which the original works were written. That is not to say that I have limited myself in this opera to the musical styles of the early 19th century (the novel was published in 1813). While I have imitated certain stylistic characteristics of the period, particularly in the dances, I was writing to engage a 21st century opera audience, which is just another way of saying that I was trying to compose inventive and expressive music that I would like to hear if I were in the audience. As one would expect, the music of Pride and Prejudice is tonal and melodic, but because the characters and situations are multifarious, so is the music. Like the novel, the opera changes gradually from comedy to poignant drama. Act I is full of gaiety, irony, humor and flirtation. Act II is deeper in feeling, suspense, and the possibility of tragedy before things get sorted out. It comes close to being a “grand opera.” It uses chorus and dancers and sometimes calls for a split stage, i.e., there is occasionally action in both the house and the garden at the same time. The orchestra, however, is only slightly larger than that of a Mozart or Stravinsky opera. It is not by accident that this is my most lyrical opera. My first three operas are quite different one from another: a satirical comedy (Tartuffe); a historical drama (John Brown); and a comic opera/musical (The Rivals). For my fourth opera I had my heart set on finding a play or novel with a great love story — one which also offered the variety of characters and situations that I always look for. Additionally, I hoped my source would be an American work, preferably from the middlewest where I grew up. But several months’ reading turned up nothing that I thought would make a good opera. Then I happened to see the old 1940 Pride and Prejudice film and a bell rang in my brain. I was not very fond of that adaptation, but it reminded me of how much I loved the book. I immediately read it again and was delighted to find how theatrically Jane Austen set up many of her scenes. (I later learned that her family and friends regularly produced plays at home.) I realized that Pride and Prejudice satisfied all my requirements except for being set in small-town England, not mid-America. I briefly considered transferring the story to America, but quickly realized that would be a great mistake. Can you imagine Darcy as a Kansas cattle baron? Finally, I want to assure fans of the novel that I love it as much as they do and have tried my best to remain true to its characters and its story. I sorely regret the cuts I had to make. But please remember: only Wagner could get away with five hour operas.